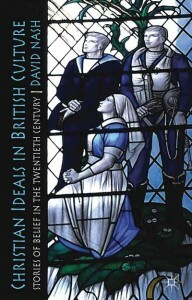 Review of David Nash, Christian Ideals in British Culture: Stories of Belief in the Twentieth Century (London: Palgrave Macmillan, 2013) ISBN 978-0-230-57265-2. The cover announces the character of the theme: it is the image of a stained glass window in Worcester Cathedral showing three resolute figures looking up towards the sky, intent, devout, broadly sanguine. One is a nurse and the other two are men of the Royal Navy and the Royal Air Force. The task that David Nash has set himself here is a striking one: in what kinds of narratives might the historian find the relationship between religious faith and active public life in the British twentieth century? How are we to locate the dimension of personal faith in the discussions and dramas of society at large? How are we to know when it is there – or when it is not? Such a project, of course, requires some recasting of conventional understandings. This book is only to some extent a study of what is often now called ‘corporate’ religion. Nash knows the importance of chasing up other, less obvious paths in search of a new prospect. Above all, he looks purposefully at the sprawling realm of the Christian laity. His chapters enjoy titles like ‘Pilgrims, Seekers, Samaritans and Saviours’, and ‘Salvation, Old and New’. Two chapters explore ‘just’ and ‘unjust’ wars and ‘Loss’ and ‘Remembrance’. The material is lively and the argument vigorous and, in the best sense, provocative. Nash asks many questions which historians have often simply ignored: how did people read the Bible? What was it in their eyes to live and die ‘well’? What was it to doubt, or to be ‘saved’? There is a persistent emphasis on the Church of England which is justified at an early stage, but which still leaves some questions hanging in the air, for it is easy to claim too much for the Anglicans and expect too little of the others. There is also a fair amount of jumping about as far as dates are concerned and this might well unsettle those who look for chronological order. In one chapter the Abdication Crisis of 1938 finds itself in company with the prosecution of the Gay News for blasphemy in 1979 and the death of Princess Diana in 1997. Yet chronology certainly does matter in this book. Nash regards the secularization debate as something tyrannous. Are so many diverse reconfigurations of faith and unfaith really amenable to one vast, unrolling trajectory of decline and extinction? ‘Secularization’ has tried to explain a great deal, no doubt, but has often only ended up distorting perspectives and getting in the way. An awareness of it has even affected the way a pessimistic Church of England, in particular, has come to understand itself. It is surely high time to claim a new freedom and to argue with quite different terms and possibilities. In short, Nash hands back the telescope that many other scholars have provided and instead picks up a kaleidoscope. The new view is fascinating, even if it is difficult quite to know what picture it presents and sort of trajectory might be at work. This book is something better than an historical polemic and the overall effect is both alert and constructive. Perhaps best of all, it does not seek to lock the subject up inside some self-serving thesis. It frames some bold ideas and opens a variety of new doors. It invites. Does it persuade? That will depend on many things. It is surely right to suggest that later twentieth century religion came to reveal not simply a decline but a ‘diffusion of authority’ (p. 192) and to observe that this should not be seen automatically as a narrative of ‘dilution’. Scholars of secularization may well have been too ready to characterize the contemporary history of religion as a glum history of waning churches and chapels and declining weekly congregations. But secularization, however we understand it, remains difficult to repudiate because there is simply so much diverse evidence about to justify it. This is not to say that it hasn’t acquired an accumulation of questionable forms, or even become something of an ideology. Nash observes sharply that even the most adept secularization theses rather often end up preaching the end of religion and creating for themselves a kind of eschatology, a definitive ‘end time’ for religion altogether. This is plainly dubious. By contrast, Professor Nash is surely right to suggest that it is better to think cautiously and sensitively, not of cycles and grand trajectories but of patterns which might be difficult to identify with confidence. Nothing, after all, is predetermined. At the last this is both a subtle book and a hopeful one. It deserves to be read by an international audience.